Mark has over 10 years experience as a session musician and educator. Up until 2011, Mark had been working predominantly in the North East of England as head of drums and percussion for Evolution Music as well as samba workshop leader and drum tutor for the beat it project before moving to London in 2011. Whilst in London Mark graduated with a BMus (Hons) degree from Tech music school, one of Londons finest musical institutions. 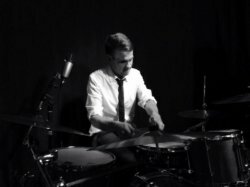 Now residing back in the North East of England Mark loves nothing more than to share his passion for drums and music with his students. Drum tutor at Glenthorne High School, Sutton. Samba workshop leader and drum tutor for the Beat It project. I feel it is important to approach every student as an individual. Everyone learns at their own pace and every individual has different strengths and weaknesses when it comes to learning. Lessons will cover technique, stylistic awareness, improvisation, ear training and theory, all depending on the needs of each student.